An astonishing collapsed volcanic caldera which has produced a vast horseshoe of cliffs, rising approaching 2,000m from the caldera bottom to the rim. A selection of superb walks with huge views over the crags and chasms of the caldera, down to the distant sea in one direction, and down through the forests of the flanks of the ancient volcano in the other. The weather here is changeable. Come prepared. This is an amazing place, a huge volcanic abyss in and around which is a wide selection of world-class walks. To the north and east is a horseshoe of thousand-metre cliffs falling into this deep ravine-riddled hole. The broken southern side boasts a walking peak and a tough descent from a rim viewpoint down into the hole. Inside the bowl are spectacular canyon trails. Twisted Canary pines cloak the lower hillsides and cling to impossible-looking cliffs. Far below are the fields and villages of the lower slopes, beyond them the endless North Atlantic. The history of the Caldeira is extraordinary. It was thought to have been created by an explosion, or by water erosion (or a combination of the two). Current theory has it that the Caldeira was formed underwater through successive eruptions covering a layer of sedimentary rock, the weight of which (on top of the less stable sedimentary rock) eventually caused a massive landslide, tearing a vast hole in the centre of the mountain. This chasm was deepened and sculpted by water (after La Palma emerged from the sea). 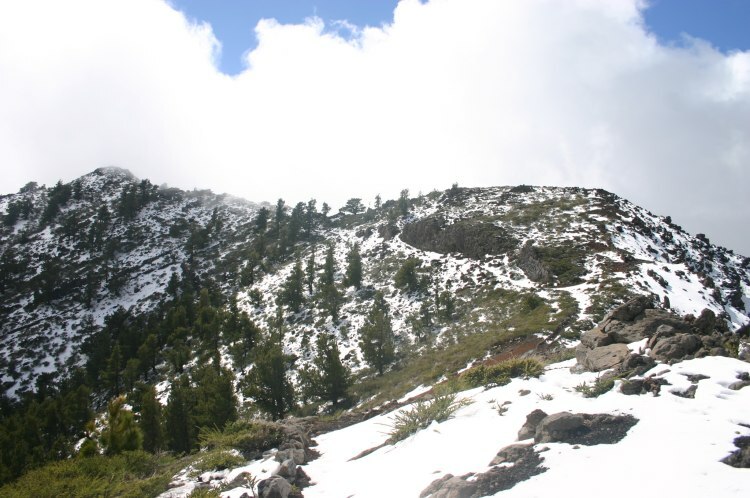 Subsequent volcanic activity has thrust up Pico Bejenado, which has created a side of the Caldeira we now see, but which is actually inside the vast, ancient bowl. The weather here can be difficult. 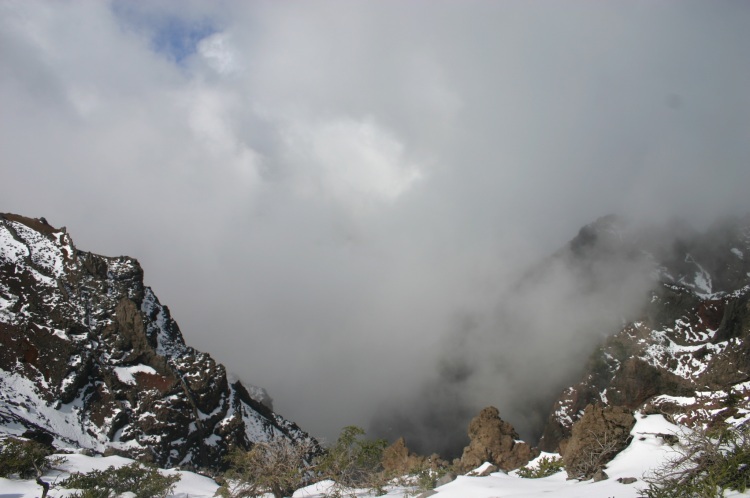 The prevailing winds bring cloud from the north-east, which can wrap itself around the summit, killing any chance of seeing the astounding views. 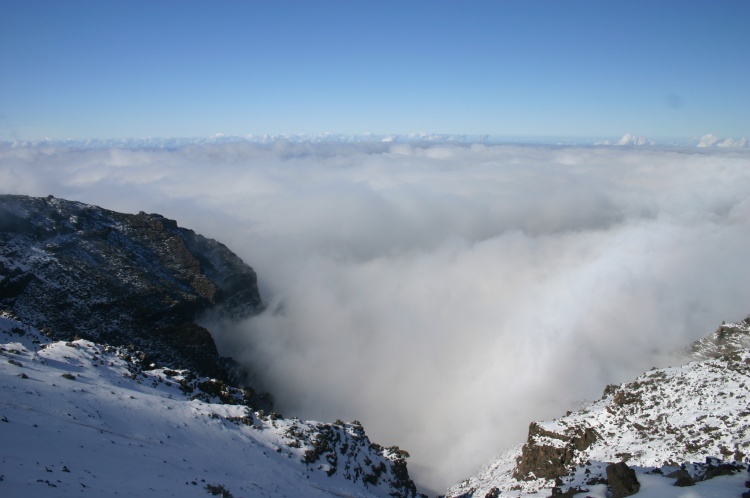 You can encounter a benign variant, where a blanket of cloud sits inside the Caldeira, with the jagged edges of the rim protruding into a clear, jewel-blue sky. 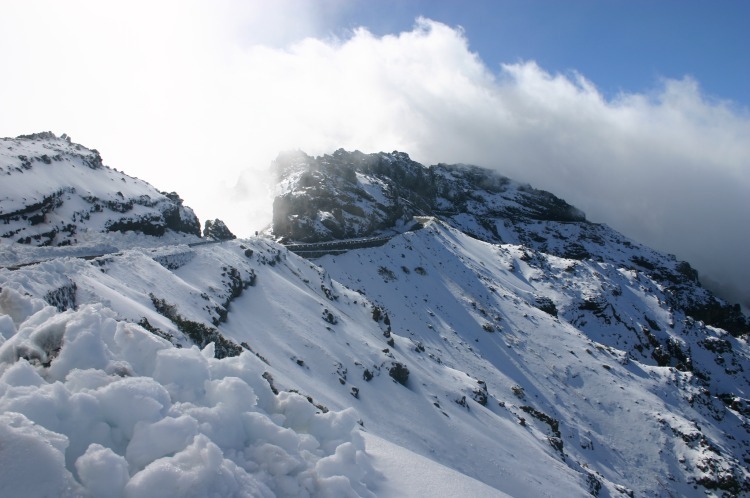 In winter, snow can prevent a walk around the rim, and can even close the access road. There is a heroic selection of walking here. At least three of them could, in their own right, come within our Top 100. As they are in the same area, however, they are treated as one walk for ranking purposes. The walk around the Caldeira rim, GR 131 or the Ruta de la Cresteria, is what every serious walker comes for, winding its way around all the pinnacles of this perfect semi-circle, from the great observatories at the north-west end to the Punta des Roques in the south-east, and on down the island's central spine, the Cumbre Nueva. This is some 25km of demanding walking, so many people break it down into sections. The first starts at the Roque de Los Muchachos, and picks its way through the broken rock of the Caldeira edge, above cliffs approaching 2,000m deep, past the brilliantly coloured, twisted rocks at the Mirador de los Andenes, across the Pico de la Cruz, at 2,351m one of the highest points on the rim, before dropping from the beautiful Pico de la Nieve (2,240m; 7,400ft) down into the beautiful forests of twisted Canary pines and pretty shrubs. The second leg climbs back up round the back of the Pico de la Nieve before swinging to the right, up to the Pico and its wonderful panoramic view of the chasm. Further on round, you join the main track at the col to the south, which emerges quite suddenly at the brink of the precipices. Then it is on round the southern-eastern Caldeira wall, then onto the great central ridge. 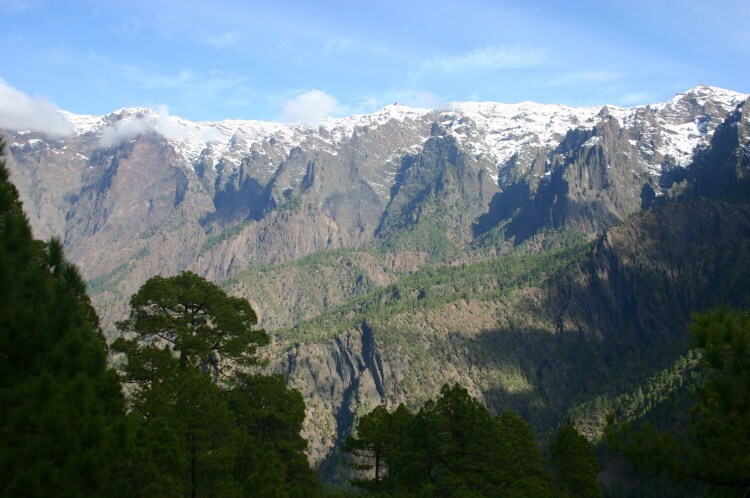 It is also possible to climb the north-western rim of the Caldeira, from Puerta de la Tazacorte to the Roque de los Muchachos, some 17 long, uphill kilometres. 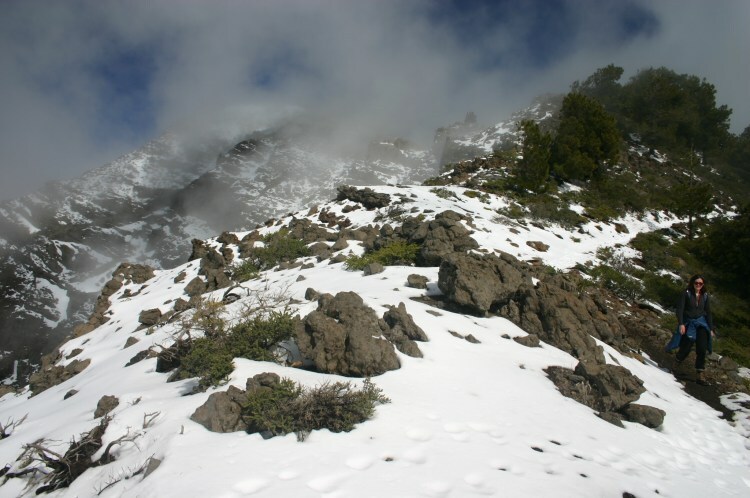 This is an ascent of a spectacular 1,854m climbing peak on the southern rim of the great Caldeira. 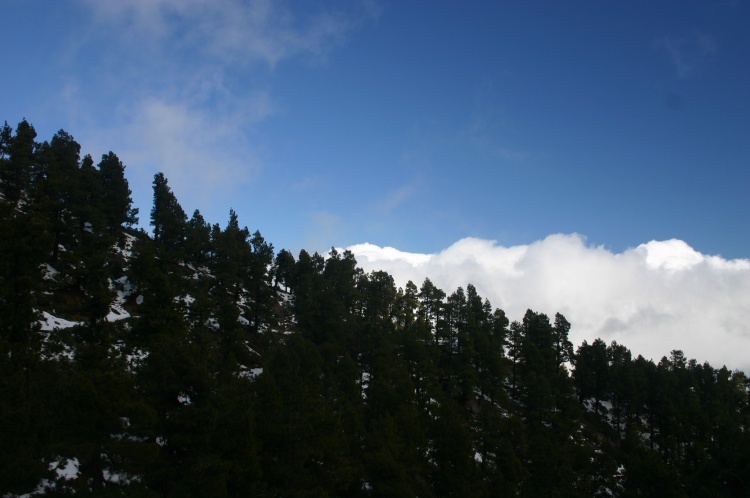 From the roadhead at El Barriel (approximately 1,100m) it is a fairly demanding climb up the steep pine-forested south-eastern slopes. Fabulous all-round views from the top. The inside of the Caldeira is a weird, wonderful mess of cliffs, spires and canyons. You can either walk up into it from the bottom of the Barranco de las Augustias to the west, from which a number of excellent walks of varying difficulty can be made, or you can descend into the void on a long, steep and at times tricky path from the viewpoint at La Cumbracita, from which it makes a spectacular traverse around the middle slopes of the eastern wall before plunging down into the depths through the tremendous Barranco de los Guanches. 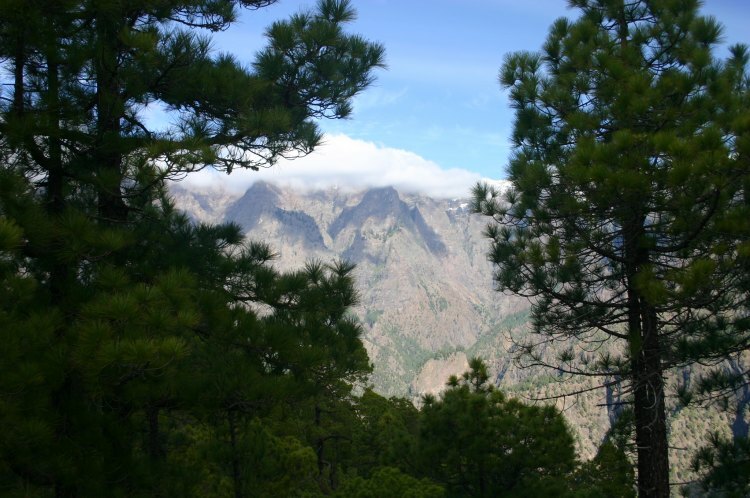 SEE OUR GREAT VOLCANIC RIDGE AND LA PALMA PAGES FOR INFORMATION AND OTHER WALKS ON THE ISLAND, FURTHER GENERAL AND PRACTICAL INFORMATION (INCLUDING SOME WARNINGS) AND PHOTOS.